Burgers have swiped the whole culinary world in Adelaide since the opening of burger theory. Over the years, there has been a lot of additions to the city and the latest one was Nordburger in Norwood. Anyway, we all know beef mince can make good burgers and cooking med rare can give that juiciness when biting, but what about pork? I know pork patties sometimes can go really dry and bland if you don’t put enough fat into it. 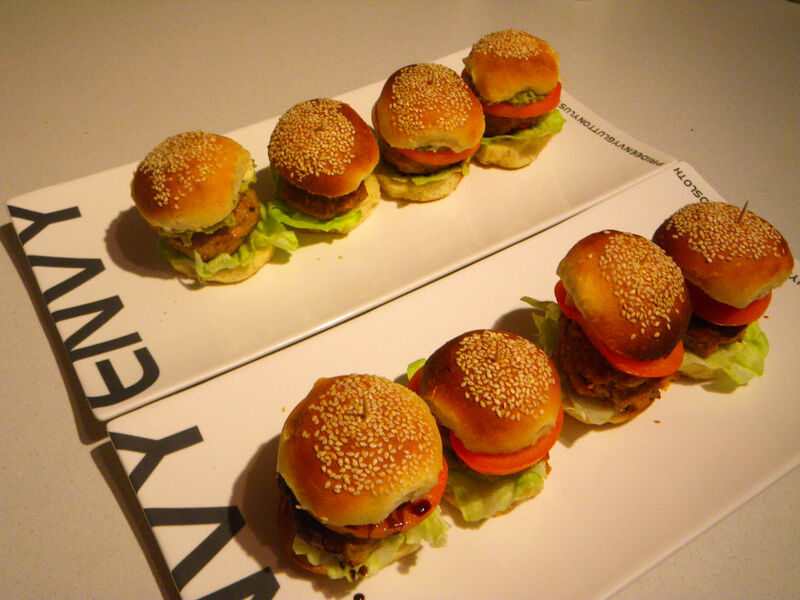 Anyway, I was crazy enough and made two specialty mini burgers using South Australian produces and Italian dressing. 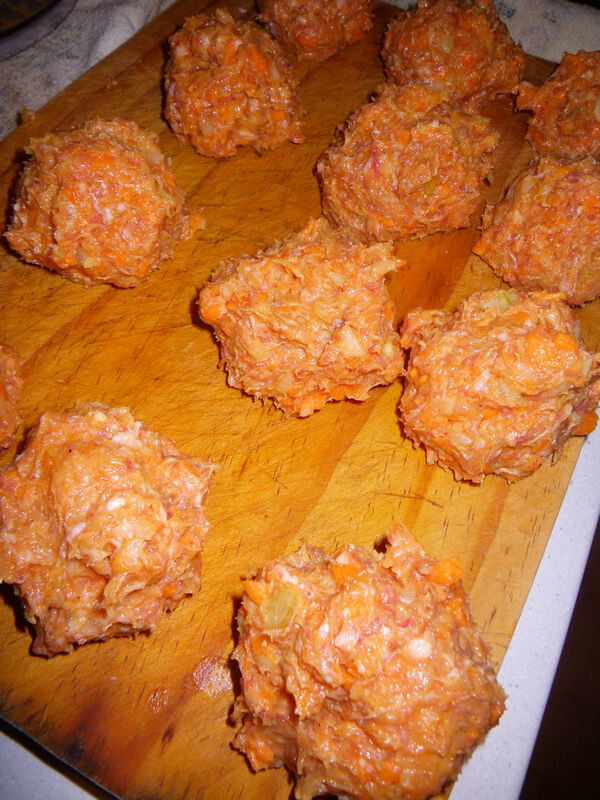 Basically for the patties, I used minced Berkshire pork from Miniribbie farm in Port Lincoln, fresh SA Gulf St Vincent King prawns, locally grown organic carrot and SA produced truffle salt to make the patties, which gave a fantastic flavour and exploding juiciness in the meat. This made me loving our fantastic state even more. LOL. Anyway, before posting the recipe, I’ll need to talk about two great products I found recently in the Central Market and they were key ingredients when I made the burgers. This is lardo, a product I found when visiting San Jose smallgoods. Lardo is a type of salume, made by curing the fatback of pig with rosemary and other herbs. I have read about lardo last year and during the Qualitaly Abruzzo dinner, Andrea from Milan Image Factory mentioned about it again as how fantastic the product is. It made me thinking that I should go and dig it out somewhere in Adelaide and that “somewhere” came out to be the Central Market. Anyway, I got the product from San Jose and was told that the product was made purely using SA pigs. Even better! 😀 The lardo can be enjoyed on its own as a charcuterie dish. When consuming, the lardo is to be thinly sliced and eat at room temperature. OMG! The taste was so fascinating that I can’t stop eating! The pork fat was fully cured and smoked with the herbs and once entered the mouth, the fat went immediately liquefied into oil and melt in the mouth in just seconds. All the good flavours of the fat, the herbs and the smokiness all flushed down the throat with the oil, leaving a pleasant and fragrant feeling in the mouth. Of course, to be a bit more fancy, consuming the lardo with a balsamic glaze would be ideal. This balsamic glaze is imported from Italy and was obtained in Marino Meat in the Central Market. The store manager Riccardo introduced the glaze to me and in fact, the glaze is considered a top delicacy in Taiwan and Japan. Anyway, this glaze is not so sour. It is thick and rich with sweet and sour flavour, but more importantly, one can expect to find hints of wine and tannin flavours in the glaze, which is quite amazing. When accompanied with the lardo, the oil from the fat actually diluted the flavour of the sauce a bit but enhanced the lasting time of the flavours in the mouth. Pairing with charred Ciabatta can be a good option here. Let’s get back to the actual recipe of the burgers. 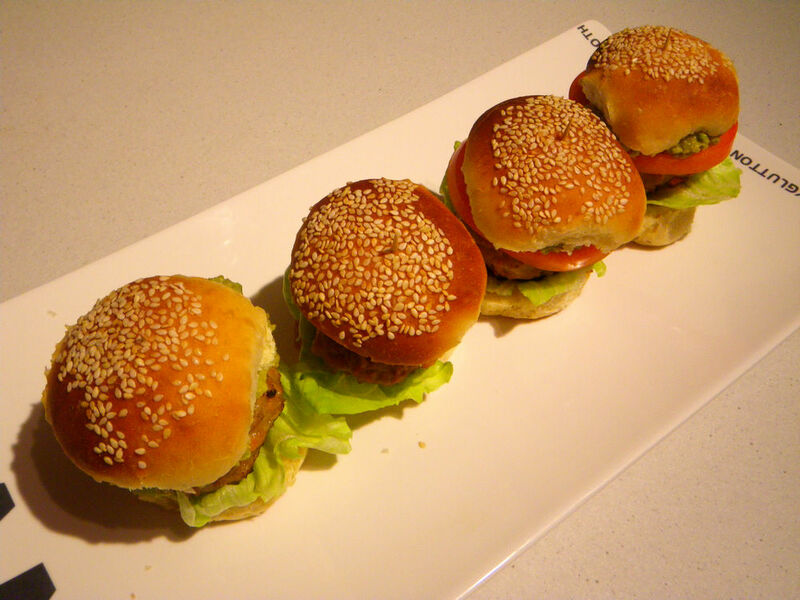 I’ll write the recipe individually for the bread roll, the pattie and the burger. 1. Mix all the ingredients in Part 1 together and heat in microwave for 50 seconds in a bowl. The paste is now very sticky. Leave in the fridge until cooled. 2. Once the paste in Part 1 is cool, to a bread maker, add all ingredients in Part 2 (except the butter) and the paste in Part 1. The machine will start its job until a dough is made. I strongly recommend the use of bread maker because if you do it by hand, it takes about 40 minutes to make a dough. 3. 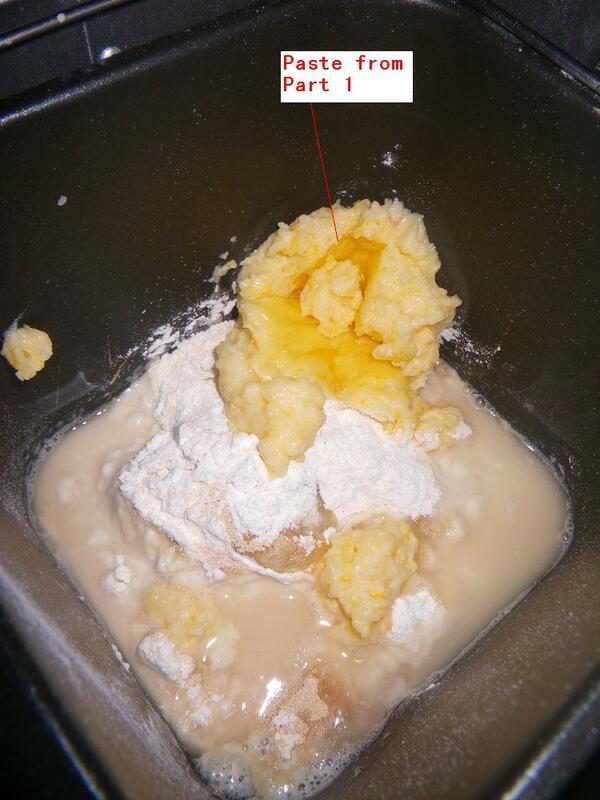 Once the dough is made, add in the butter and continue to mix to give a smooth dough. 4. Leave the dough to rest to double the size and divide into 12 equal pieces. 5. 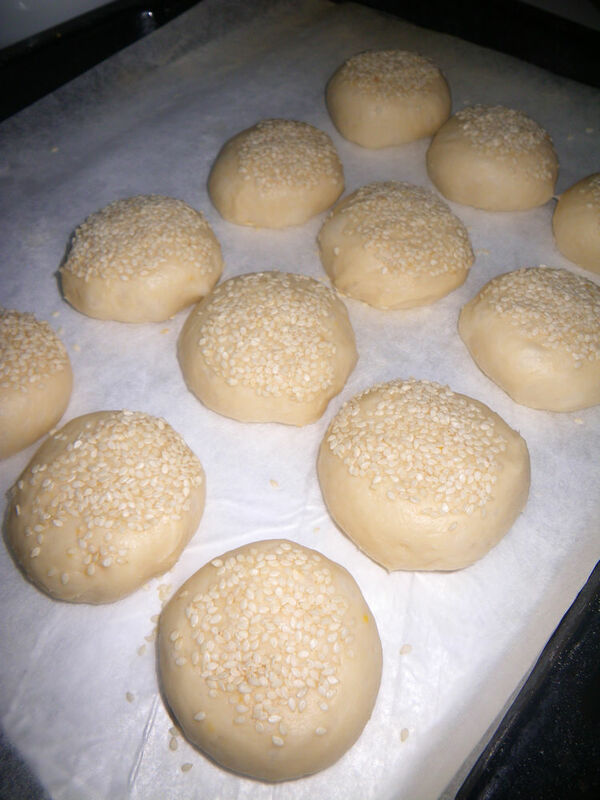 Make each dough piece into a ball shape as shown and top with white sesame seeds. 6. Rest the dough pieces for 40 minutes and bake at 160 oC for 15 minutes until the bread changes color as shown below. 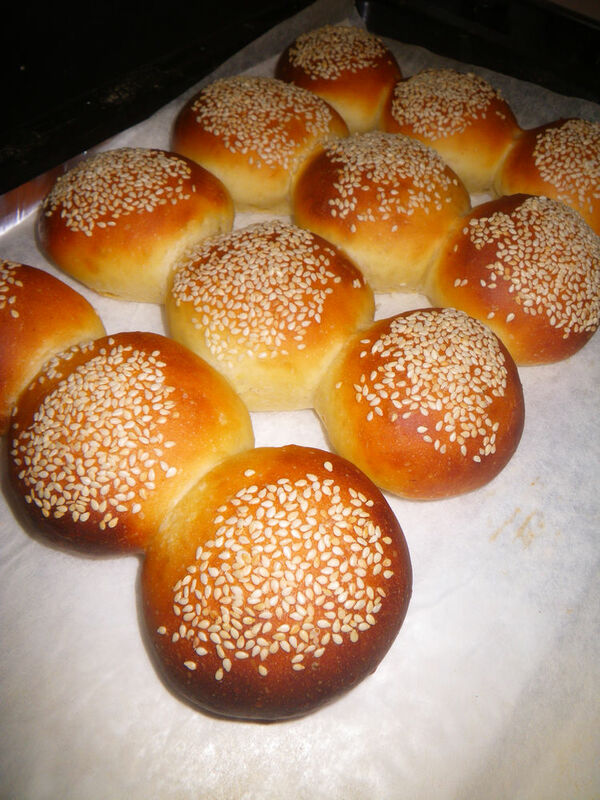 The bread roll is very soft with good structure and air pockets. It can be used as it is or can be char grilled depending on your liking. I used the roll without char grilling. 1/2 onion – The purpose of having carrot and onion is to create crunchy patties. 1. 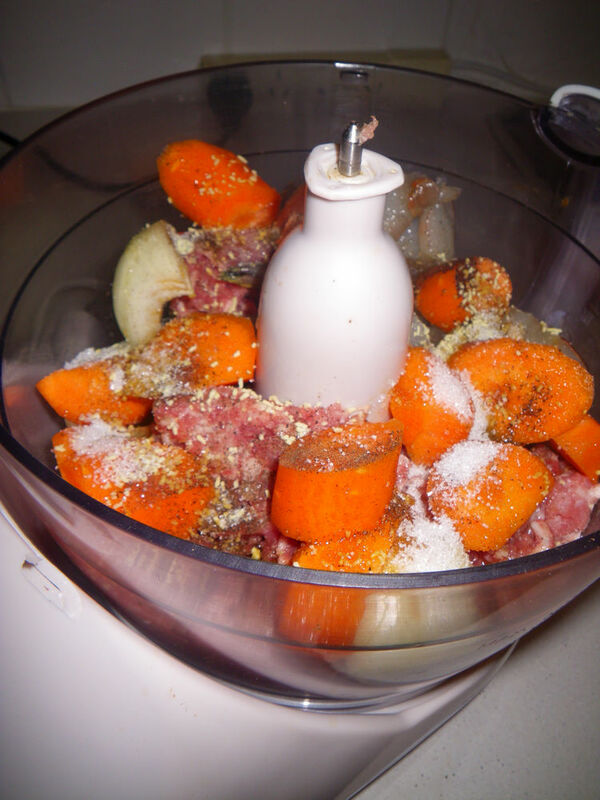 Place all ingredients into a food processor and blend for twice to make a smooth content. Make sure all carrots, onion and prawns are all mixed well into the paste. 2. Once the smooth content/paste has been made, divide into equal pieces and shape into a ball shape. You can make patties now but I like to make them while in the pan. 3. Pan on, oil in and start cookin. The patties will be easily cooked with charred marks on both sides. The smell is so good and I can smell it even outside my place. A strong pork aroma with fresh prawn/seafood fragrance is on the nose. Beautiful! Even you over cook the patties, it will still be pretty juicy and tender inside. I made the mini burgers with two toppings but the same patties. 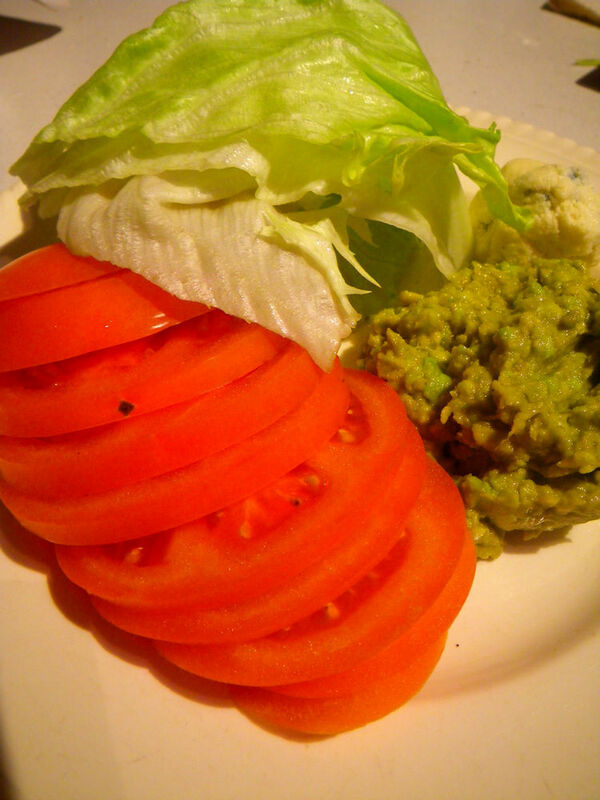 One was topped with wasabi avocado salad and Castello blue cheese (imported). 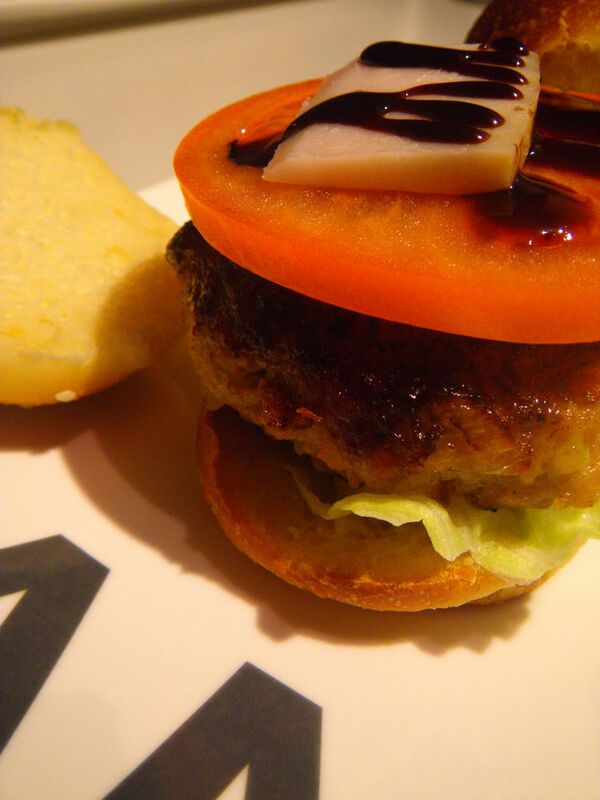 This little burger introduced bitterness and wasabi flavour into the meat when biting. The patties were so moist, juicy and tender and you can see the juices running into the plate. LOL The bread rolls were crispy on the top and soft in the center and kept its shape well after each bite. 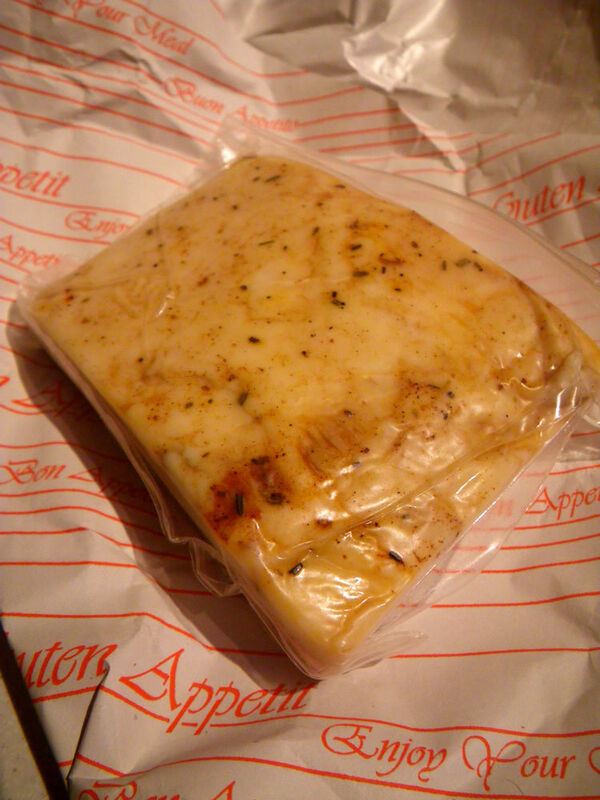 The blue cheese melt gradually along the eating process and gave complex flavours on palate. 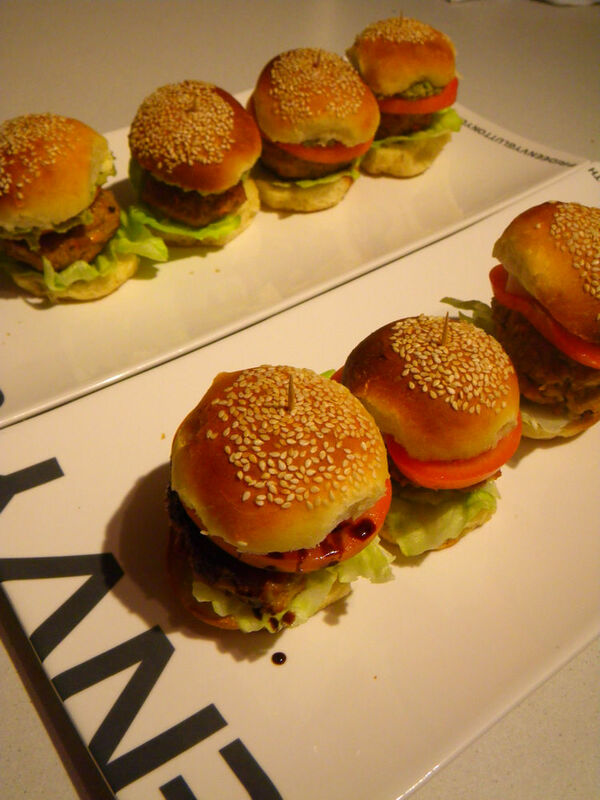 The second lot of mini burgers were topped with lardo and the balsamic glaze I mentioned above. Oh, man, it was so wonderful! You will not know the kindda feeling unless you experience it yourself. The lardo eventually melt in the mouth and carried all flavours of the patties and the balsamic glaze around the palate from top to the tongue. Diners can expect to experience complex flavours in the order of sweetness, Berkshire pork, seafood, truffle, herb and balsamic vinegar and red wine during the course of eating. The experience is just amazing! Coming up next is my Pan Fried pork with sweet and sour capsicum. Stay tuned! Vegetables you have in your burger meat is what I put in my spaghetti meat sauce. I am impressed with home bake bread part too! 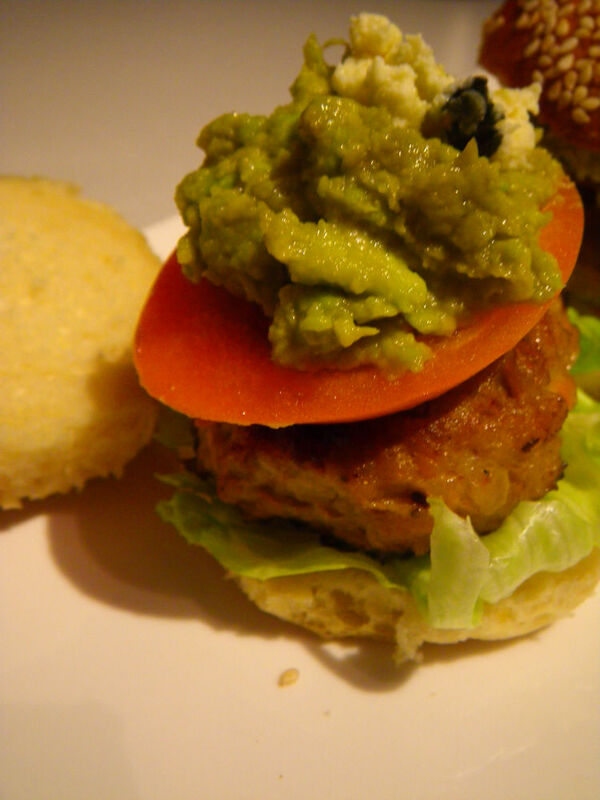 I love everything about these mini-burgers… and the wasabi avocado salad! G’day Xin! It is only brekkie, true! I could definitely go for one or two of your burgers and love San Jose Lardo and balsamic vinegar too! That lardo and balsamic glaze are very tasty just by looking at them! Does Barossa Fine Foods produce the same thing? Please let me know. To my best knowledge, yes. Barossa Fine Foods does make this lardo products and are selling them at similar prices as San Jose, but I haven’t tried their stuff yet. Hopefully once I finish with the San Jose one, I’ll check them out. Pork burger?! You crazy man. I don’t think it’s going to be better than beef ones. I guess this is really something depending on your taste. I created this recipe because I wanted to show that pork can also make burgers while beef burgers are absolutely fine. Thanks for the kind words! 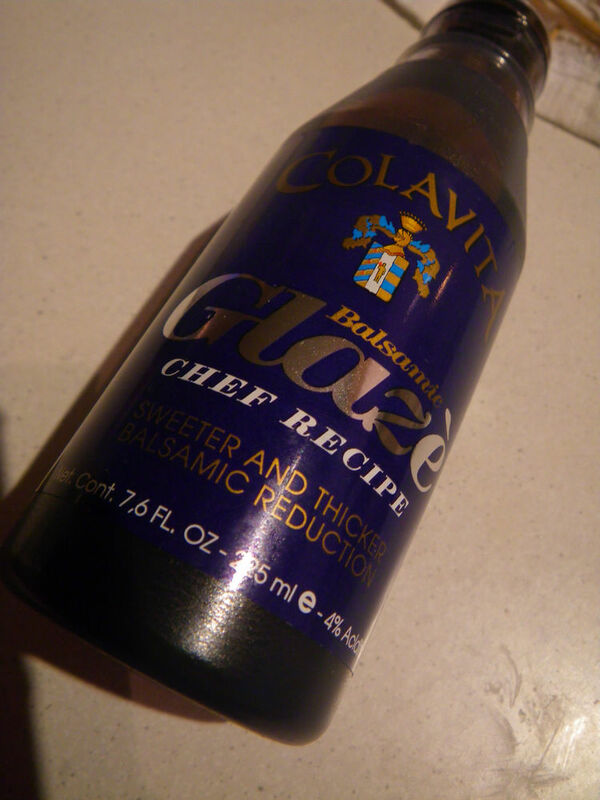 The balsamic glaze, oh, is much more than satisfactory! Thanks Stefano! Yes, the lardo bit was spectecular. Initially I wanted to make a roll with lardo, balsamic glaze and veges only but my wife went, why not adding it to the burger. Awesome result! Oh my! Your buns look so professional and cute!